Here’s an individual plated dessert that’s simple to assemble yet impressive in presentation. The dish is a study in contrasting textures: Moist, date-flecked cakes paired with silky sauce and crunchy pistachio brittle. 1. For cake, combine dates, figs and water in a saucepan and bring just to a boil. Let cool completely. Add baking soda and vanilla. In a separate mixing bowl, cream butter and sugar. Slowly add egg. Alternate adding flour mixture and date mixture. Add pistachios last, making sure to scrape sides of bowl to incorporate all ingredients. 2. Preheat oven to 350 F. Prepare 3-in. ramekins or muffin tins with cooking spray and coat with sugar. Fill with batter. Bake 25 to 30 minutes until firm and a toothpick comes out clean. 3. For cherry rum sauce, in large saucepan, combine all ingredients; bring to a boil over high heat. Reduce heat to low and simmer until cherries are tender and the juice has reduced by half. Remove cinnamon stick. Remove from heat and cool until needed. 4. For pistachio brittle, in small saucepan, combine 1/2 cup water and 1 cup sugar. Cook until mixture turns an amber-colored caramel. Add shelled pistachios. Pour onto a parchment-lined baking sheet. Cool completely. Break into large pieces by hand. 5. To assemble, turn out cakes from ramekins. Place each cake on a plate. 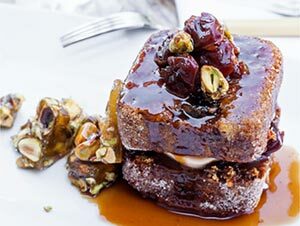 Top with Cherry Rum Sauce and garnish with Pistachio Brittle.